This post is sponsored by PUR, a partner of Heartbeet Kitchen. So much of what we do in the kitchen starts with the simplest of ingredients — water. Yet not all water comes to us in a safe condition for drinking, and subsequently, cooking. Brian and I live in a classic brownstone building, built in 1901 here in St. Paul, Minnesota. It isn’t a single home, but rather six homes divided amongst the 10,000+ square feet. The original floors are what we walk on, the woodwork was crafted by someone’s hands, tall ceilings — these are the things I fell in love with when I moved in 8 years ago. But with its historic charm comes some things that aren’t so great. One of those attributes is the old pipes and water system, that ends up putting impurities into our water, like rust, zinc, and other contaminants. To combat this, I hauled 20 pound tanks of filtered water up to our kitchen every week for the past how many years…… Ugh. But in working with PUR, I discovered that I could simply attach their filter system to our faucet, and within seconds, the water flows clean. The filtration system is certified to reduce over 70 contaminants, including 99% of lead, 96% of mercury and 92% of certain pesticides. 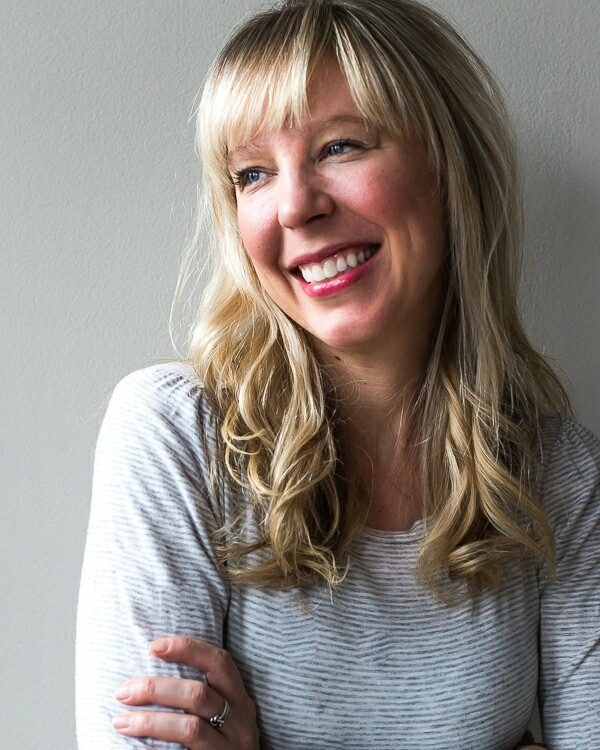 This being the first week we’ve had it, I realized just how much I rely on clean water — whether it be for drinking, filling pet bowls, pasta, making nut milk, rinsing fruits and vegetables, soaking dates or raisins, the list goes on. 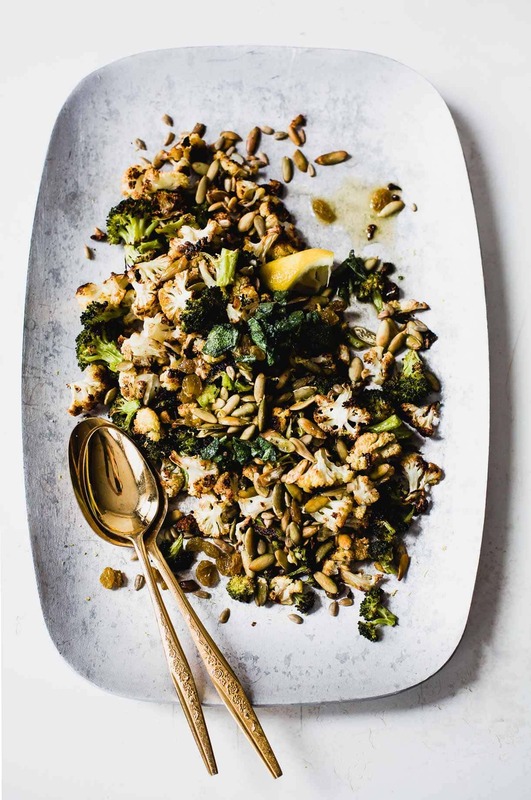 For this recipe, I specifically used the purifier for rinsing the cauliflower and broccoli, along with soaking the raisins to plump them a bit. I’ve mentioned it before, but I’m the type who typically brings some a hearty vegetable or grain dish to family gatherings or parties. I find it adds variety to a table of mostly appetizers, and truthfully, what people are craving — they just don’t know it. That is until they see it. 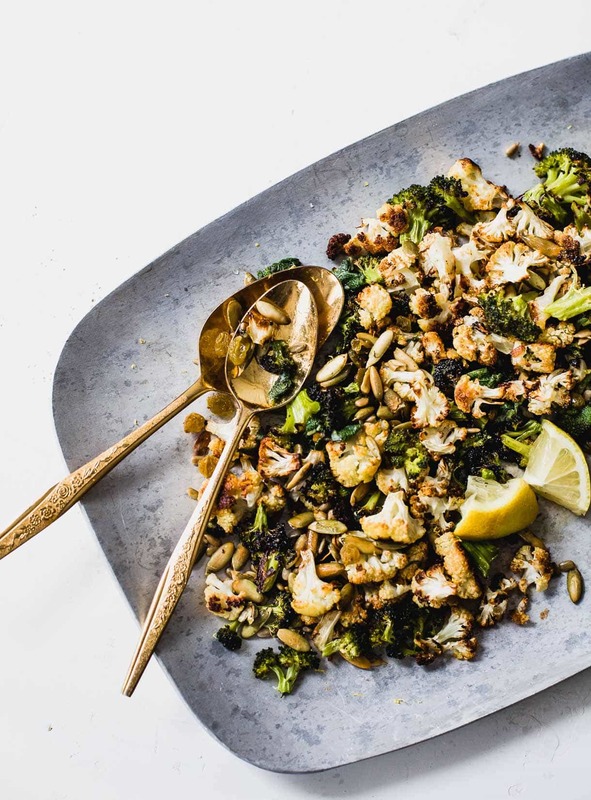 This warm, Roasted Broccoli and Cauliflower Salad recipe is one I’ve recently developed to please a crowd, as I find these two vegetables have a better reputation than ever before. They’re the cool kids on the block, and for good reason – they’re delicious, especially when roasted. 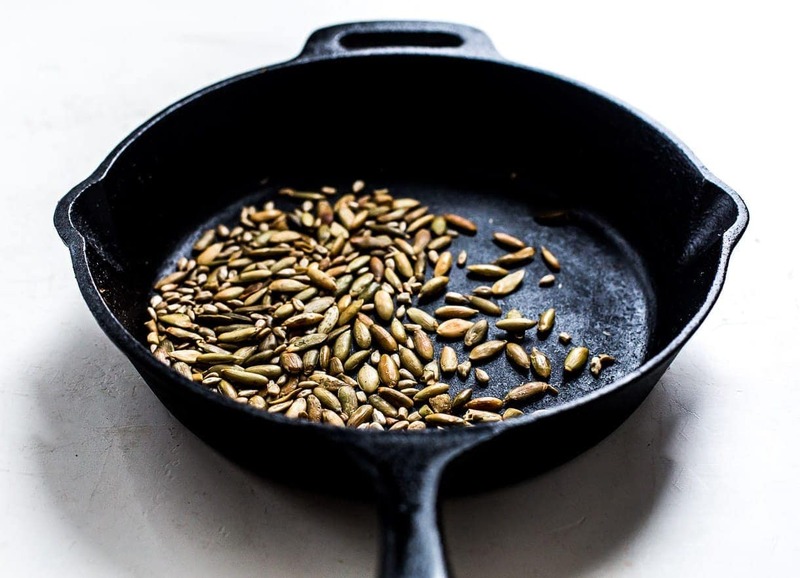 Drizzled with sage butter, a sprinkling of pepita and sunflower seeds, and plump golden raisins scattered throughout, it is my dream dish. The one I’d pick out on a restaurant menu in a second, and with each bite, try and piece it together in my head to recreate at home. Lemon zest and juice are not an afterthought, rather the components that make this salad sing with brightness and balance the caramelized vegetables. 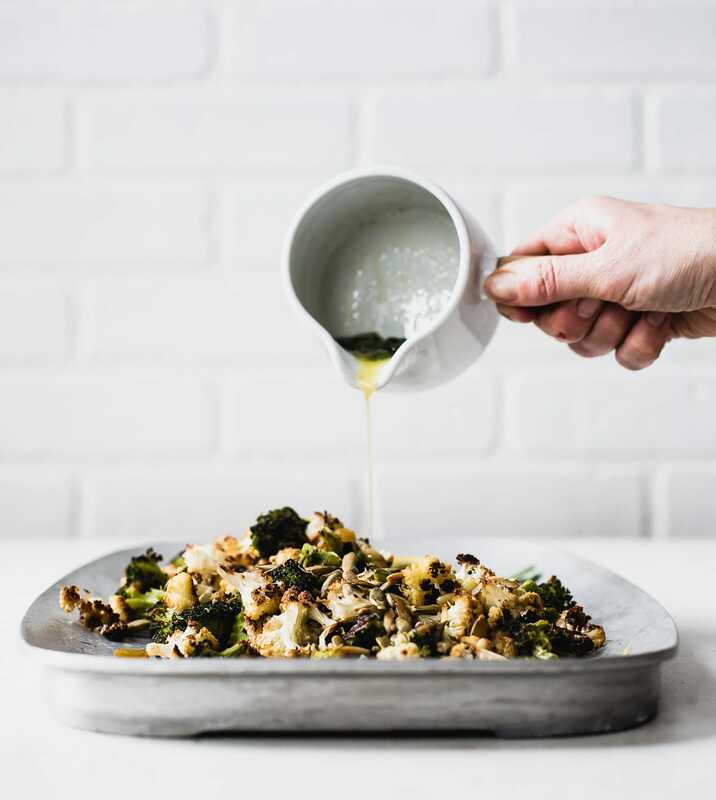 You’ll notice the cauliflower and broccoli roast in a 400 degree, something that combined with the proper amount of olive oil, is quite important for achieving the golden brown status. The best status, right? Flavors concentrate as fibers buckle, water escapes and steams away, and your vegetables turn into their most handsome selves. 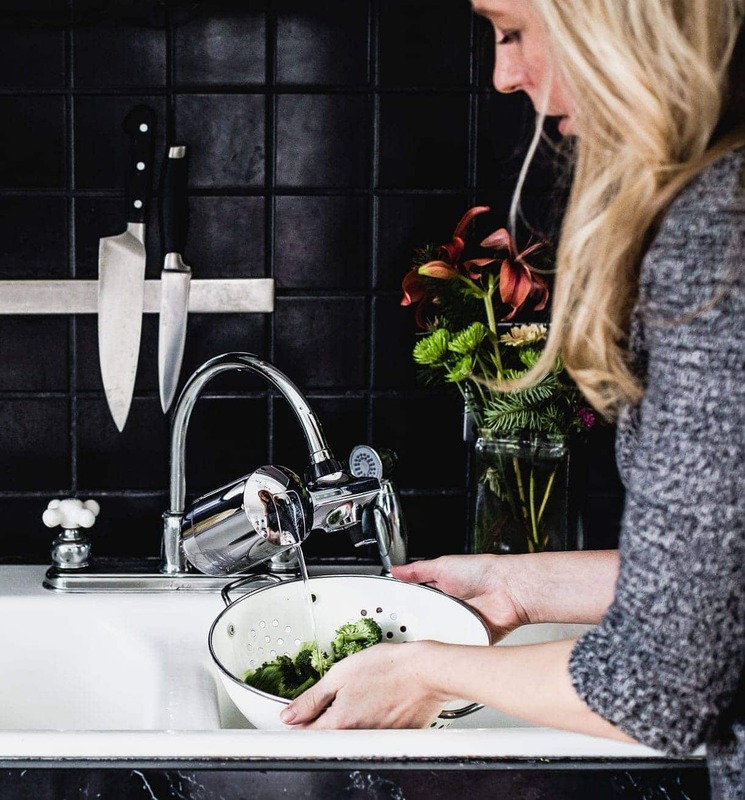 PUR is also giving away win a 10-piece cookware set and a “Year of PUR” (one PUR Advanced Faucet Filtration System, one 11-Cup Ultimate Pitcher Filtration System and replacement filters for each). The 10-piece cookware set has a blue gradient and is porcelain enamel nonstick. The set includes 1-quart covered saucepan, 2-quart covered saucepan, 6-quart covered stockpot, 3-quart covered saute, 8.5-inch skillet and a 10-inch skillet. A $272 gift value. And the winner is Lindsay Chryssis! Preheat oven to 400 degrees F. In a bowl, toss broccoli with 1 1/2 tablespoons olive oil and 1/2 teaspoon salt. Spread onto a baking sheet. Then toss cauliflower with 2 tablespoons olive and 1/2 teaspoon salt. Spread onto another baking sheet. Add sheet pans to oven and bake for 20 minutes, turning once. Remove broccoli, which should be golden brown, and set aside. 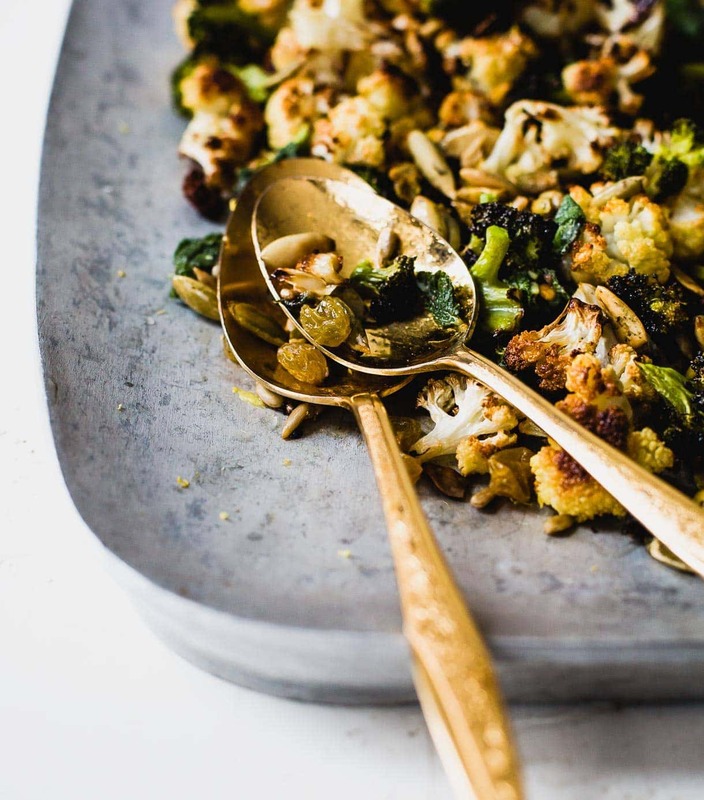 Bake cauliflower for another 15 minutes, until golden and tender. Remove and set aside. Melt butter on stovetop with sage, and warm for 5 minutes, so butter is infused. Combine cauliflower and broccoli in a bowl, then pour on butter and lemon juice. Toss with your hands, lightly. Add seeds and golden raisins, lightly toss again. Pour onto serving platter and enjoy. This side dish sounds amazing! Love all the flavors and textures you have going on! I love the crunch from the seeds! A new favorite for us. Thanks for reading! I use a Brit’s pitcher both at home and for camping. I used the refrigerator filter for all our drinking water but it is a pain to use for filling pots. I really should look into a filter for our kitchen sink. I’m always looking for healthier side dishes for Christmas. I’m going to give this one a try! I always tell my young cooking students that roasted broccoli is one of my favorite foods and they all laugh. Then we make it and (for the most part) they all love it too! This salad is gorgeous, can’t wait to try it. i absolutely love warm salads! and so good to be with you today. enjoy the rest of your visit! This looks so good, and by the way, I love your silverware!!! Also, we have used a Brita filtering system for as long as I can remember. thank you! i found the gold serving utensils at an antique shop. thanks for reading, xo. We actually don’t have a filtering system in place, but would love to. As a distance runner I drink a gallon of water everyday!